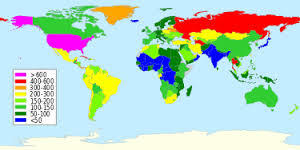 We have more people locked up in America than any other country in the world, The US is in purple which means we lock up over 600 people per one hundred thousand people. This map is a few years old. It is actually closer to 700 now. That might no even seem like a lot. We have states were there a lower percentage, and then there are states that have towns where half the residents are either locked up now or they have been locked up. There is a reason for that. Many people are now only beginning to see what is going on. It’s now no longer hidden away. More and more it’s making it’s way into our headlines. Do we have more criminals? Do Americans have a greater tendency for crime? No. It’s just business, that’s all. Just like the south had plantations and needed slavery to continue because without it the plantation owners would have a money problem. Who cares if people were tortured, women and girls were raped, men were whipped and families were turn apart? It’s just the cost of doing business. They weren’t white so what was the big deal? Most people really don’t understand the business of prisons. Aren’t they for locking up bad people? Well . . . yes. Some of them. People don’t thank that for many of the human beings living inside it is a living hell. The sentence they receive in the courtroom is only part of sentence they get. That sentence starts when they get inside and deal with their captors. Those people have the license to be as cruel as they want to be, and their bosses will just turn a blind eye, even if a person dies from the abuse. Prison conditions are not safe for inmates. There is no justice in prison. I used to think if Jamie was locked up away from other inmates at least he would be safe. I know being out in the general population, or gen pop as it’s known, can be dangerous. There is wide variety of people locked up and many of them are people with nothing to lose. You can’t turn your back on anyone, or trust anyone at any time. It worried me when he said he was making it up the levels from G5, which is also called Adseg or administrative segregation. I suppose it is a nicer sounding word than calling it solitary confinement, or the hole. When you are locked up there you have no human contact with anyone unless it’s a guard grabbing hold of you either to cuff you or hurt you. In adseg the guards are supposed to take you to shower three times a week, but that doesn’t mean they will. If you are in a prison in the south, like Texas, there is no air conditioning. It’s like living in an oven. If you have someone who puts money on your books, and if you allowed to go to the commissary once a month, you can buy deodorant. If not, you stink. Being able to take a shower is the only way to get a little relief from the relentless heat and humidity. Taking away your shower is one way they punish you. Taking away food is another. They may substitute it with something called food loaf your dog wouldn’t eat. Or they will take away being able to go to the commissary. Sometimes they even take away all of your property – everything, even your mattress. Your food comes in through the food slot. Jamie has seen his food spit on before it was given to him, with a smirk on the guard’s face. You are supposed to be allowed outside your cell one hour a day to walk, while shackled, to another slightly larger cage. This is supposed to be your one hour allotment of being “outside”. In this tiny cage is where you are supposed to exercise, if you choose. You are in that cage alone. Sometimes that cage is indoors and you don’t even get to see the sky or breathe fresh air for months at a time. Even the strongest person can easily lose their mind. It has been proven that any more than fifteen days in these conditions like this can begin to alter the mind in negative, often irreversible ways that make it even harder for inmates to reintegrate back into society when they are finally let out. Inmates lose the ability to tell if it is night or day. Lights are left on twenty four hours a day. There is no way of keeping time. Meals are often the same so you don’t know if you are being given breakfast or lunch. Paranoia easily sets in and conversations with people not really there are often the only ones to talk to. Many in solitary confinement will harm themselves physically, either to see if they are still alive or to kill themselves. If they don’t have something that will cut through the skin they might bite themselves to open a vein. If their mind is gone they might smear feces on themselves and on the walls and floor. Living every day in solitude with no one but yourself and your imagination can be pretty rough. Sometimes your imagination is not your friend, but instead preys on your fears, your loneliness and tears down your will to live along with your self esteem. The effects of living in solitary are worse than most people can imagine. The isolation and deprivation are more than most people can handle. Often the people in solitary are those who are already insane. The mental hospitals were closed down. Law enforcement doesn’t know what to do with these vagrants they find. They can’t keep them at the jail. They can’t keep them in the hospitals. The only thing to do is lock them up. They won’t get the treatment they need and looking them up in isolation only makes them sicker. They can’t let them out in to the general population at this point because they would likely end up hurting someone. So the general thought was to put them in isolation because it is safer for them there. Doing that finishes off what is left of their sanity. 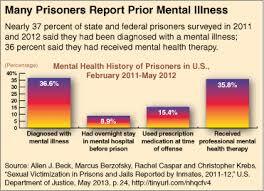 There is no thought put into a prisoners mental health. It doesn’t matter. They don’t care. What does it do to a guard’s mind after witnessing this day after day? Guards also have to work in these units without benefit of AC, wearing heavy uniforms and often protective gear for when they have to move an inmate from one location to another. They don’t care if an inmate are sick. Taking them to medical means more paperwork to fill out. It’s doubtful medical will do anything about it, anyway. So what if the inmate has a seizure from epilepsy? Medical care in prison is only given when they have no choice, and even then it’s substandard. They’ll just let the next guard on duty to take him to medical. Is that how people are cared for when they have a seizure? Isn’t there something wrong with this picture? What happened to the guards ability to care about them because they are human beings? How can they clock out after their shift and go on and have a normal day? Guards don’t care if you get your shower, or if you have edible food or water. Mess with them and just shut your water off for days. If you die because of it there aren’t any repercussions, except maybe they’ll give you a job in another prison. If it’s bad enough you might get fired. But you won’t get convicted and go to prison just because your actions killed a few inmates. Tempers run high on both sides. The inmates get angry, but they aren’t allowed to get angry. If they do the guards will write up a case on them. No one, not even the warden will do anything about it. They hear complaints all day long about the same thing. Instead of fixing the problems, they just let the officers and the supervisors do what they want. After all, they are just inmates. This needs to change. There is much about our prison system that needs to change, from locking up kids, straight through to solitary confinement. It’s big business and a lot of money is at stake in keeping the status quo. Many guards, like our police, who have been in the news more often as the people get angrier and angrier at having their family and neighbors locked up. When you ask a child now what he wants to be when he grows up I doubt you will hear the words “I want to be a policeman” anymore. The police used to be a friend of the people who helped them. That changed a long time ago. There is so much corruption in our police force that many of them need to be locked up with the bad guys. I think many begin their jobs with the best of intention to do a good job, but it doesn’t take long to find out that being able to be a good cop is very hard to do. The nature of the job changes people. Police, and prison guards, like their position of authority. It’s addicting. They take advantage of being able to make people do what they want them to do. Prison guard crimes don’t carry the same weight when it happens inside a prison instead of in society. But does that make them any safer to be around?Many think they are above the law because their superiors look the other way, condone their actions and make excuses for them when people die. They don’t have to live through the consequences of their actions. At least until now. Times may be changing. But as long as your superiors are telling you that inhumane treatment is acceptable, and people have no way to retaliate, it brings out the worst in their nature. Many people, men and women who get this job of authority are put into the position of being able to hurt people indiscriminately. Many people end up dead or at least seriously injured. What a perfect job for a sick mind. Does that mean all guards or police are like that? Of course not. I believe the guards who work with the general population have a dangerous job. They are around many inmates who would rather see them dead. Guards have to worry about these inmates when they get released. Will any of them hunt down where they live and hurt their families? For all the inmates who shouldn’t be there with sentences that were too harsh, there are just as many very dangerous criminals who have life sentences and have nothing to lose if they hurt the people around them. That is why I was concerned when Jamie made it to G2 level, because you have to have eyes on the back of your head. There are gangs who would think nothing of sticking something sharp in you. Sometimes the guards get hurt, too. The guards who work in the lower level units are different. That fear of being hurt by an inmate is pretty low, and they seem to enjoy provoking them to the point the inmate can’t take anymore and they lash out. If it is your nature, being able to hurt people you control is much more fun and amusing because there is nothing the inmate can do about it. The guards are always in the right and the inmate is always in the wrong. Sometimes they are put into “The Hole” for only a small infraction of a rule, or for talking back. Sometimes they are put there for their own protection because their life is in danger. Because of the lack of mental hospitals there is no place to put people when they can’t live in society. It doesn’t mean they are criminal. It means they need to be in a hospital, not punished. When they keep them in isolation it furthers their psychosis. If they do harm themselves, they will be taken to medical to be stitched up and then put back in solitary with an increased sentence. It’s inhumane, and the inhumane guards who guard them develop their own psychosis that tells them it is okay to torture and harm the people locked up, and do it with a wink in their eye, knowing they have full power over the inmates, so they better get used to it. The conditions described are horrible, but this is an important article to read to better understand what goes on in our prison systems. Thank you thank you. I put up part 2 last night and I’ll put up part 3 this evening. It was just too long to print at one time. I will also be soon putting up a video by someone who went through the system for 13 years starting as a 15 year old, certified as an adult. He didn’t make it through very well and it’s heartbreaking. It’s called “The Stick Up Kid”. I’m putting it up after part 3. I’m trying to work with him through video chat. Give him hope. It’s hard not to be an activist when you see what they do to people in prison, especially when they are kids.